The group did Hey That’s My Fish, Imperial, Perudo Dice, King of Siam and China Moon for Round 1. As it was still early (ie before 12 m/nite), most of us decided to stay back for more gaming! Read the first part of this meetup report where there’s a full write-up on Imperial Non-investor-card variant. 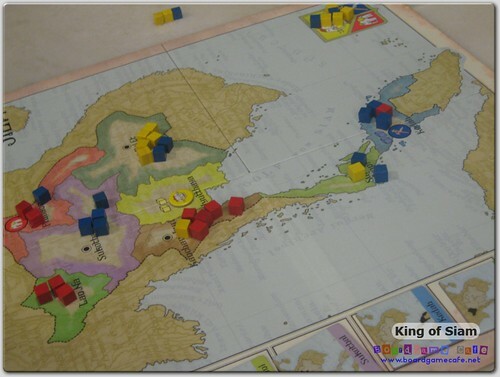 Phuah’s group continued with another round of King of Siam – guess they really like this quick brain-burner game – and this time, they taught the game to shrapnel/cmun. I believed they did a 4-player game with neu and shrapnel/cmun. 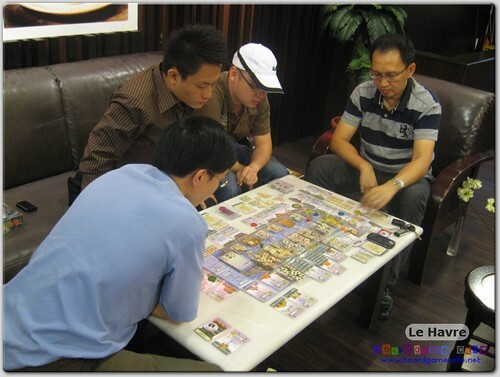 On our table, after blownfreaks + crabzai left for an early night, cliff joined us for a 4-player Le Havre, the current hot game at OTK Cheras. I haven’t yet written a sessrep or quick review of this game – the latest from Uwe Rosenbery, the same designer of Agricola – so let’s get that sessrep going. 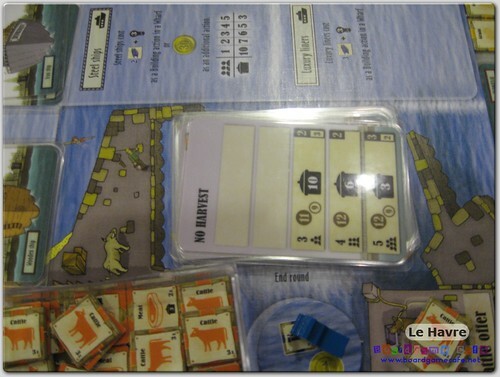 While Agricola was about farming, Le Havre is about shipping. 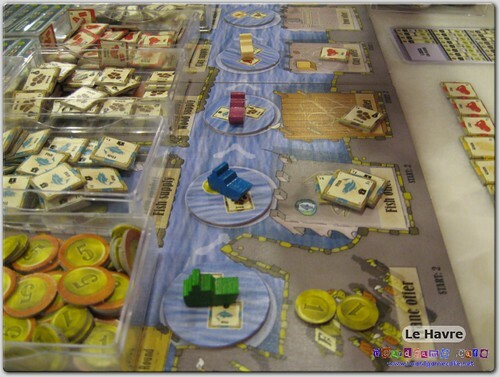 Set in a French city with the 2nd largest harbour (in France), the objective in this game is to be the one with the most money (francs) at the end of the game. 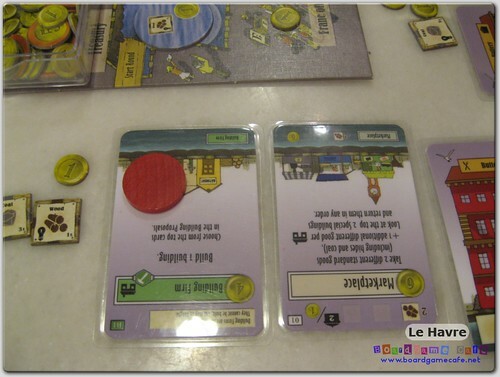 Money is the VP here and unlike Puerto Rico or Caylus, you do not have to worry about converting money to VP, and timing when to switch from money-generating mode to VP-generation. 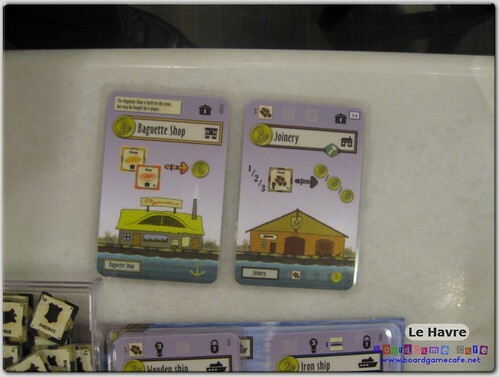 The key items in Le Havre are i) resources, ii) buildings and iii) ships. There are eight resource types in this game; from the basic stuff like grain, fish, wood, clay, coal, iron and cattle to processed items like bread (from grain), smoked salmon (from fish), charcoal (from wood), bricks (from clay), coke (from coal), steel (from iron) and meat (from cattle). You can also get hides from the cattle and later processed them into leather. 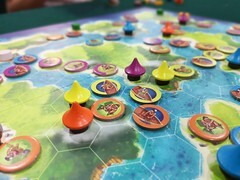 Resources arrive on each player’s turn (from the round disc) into the harbour space (right). 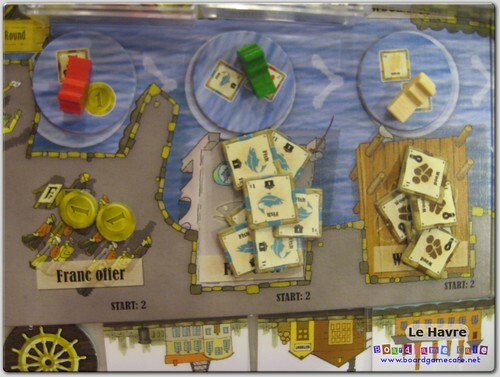 From picture above, you can see resources available for grab were two coins (francs), three fish (blue), one wood (brown) and one clay (red). The resources are grouped into three basic usage; as food, to build, and as product to sell. 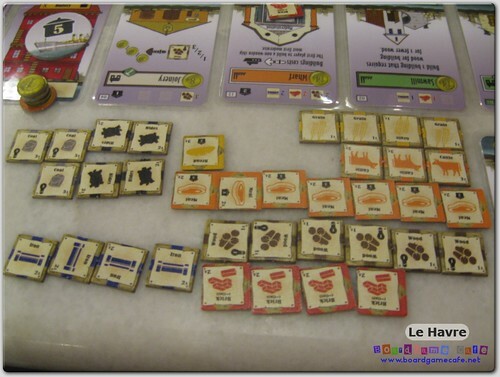 Le Havre kept the Harvest/Feed routine from Agricola though in Le Havre shortage of food is more forgiving. You still need to ensure you get a good food source secured otherwise you can be huffing and puffing for food sub-optimally. The End of Round card that determines i) if there’s going to be a Harvest or No Harvest for this round, and ii) the amount of food each player needs to provide to feed their workers. 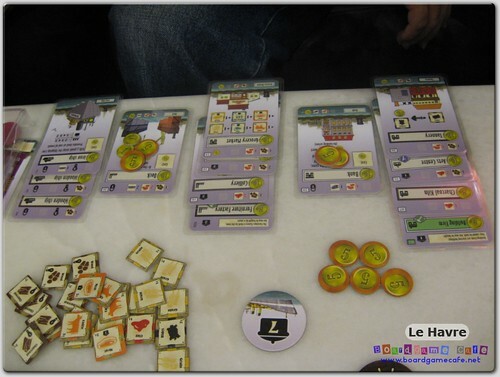 In the picture above showing the End of Round card for Round #12 (in a 4-player game), there’s no Harvest for this round and each player needs to feed 6 food (as indicated by the black pot icon). Okie.. what if we do not have enough food? Do we beg (like Agricola)? Fortunately no. 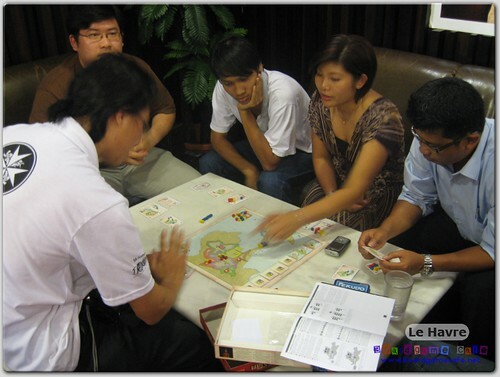 Le Havre provides an escape clause for you.. you can take a loan which provides the money to buy food. Each loan has only a small interest rate of $1 per round (regardless of how many loans you have taken). 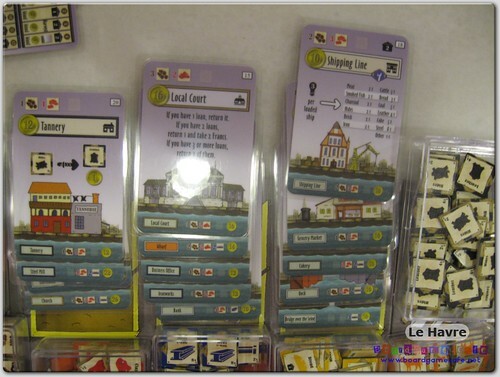 Loans are not punitive in Le Havre (unlike say Age of Steam) and in fact there’s a viable Loan Strategy where you leveraged on the funds the banks are so willing to loan you to build up your food & revenue engines. Even though this player has 3 loans, he still pays only $1 interest per round. 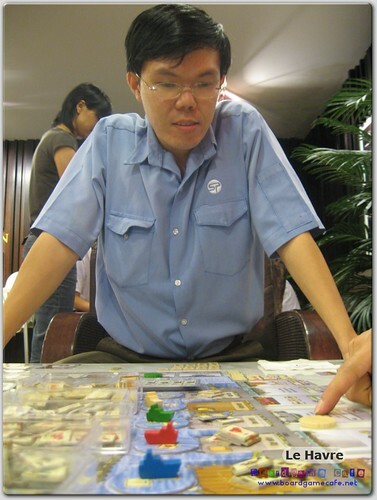 At the end of the game, he has to pay back each loan at $5/ea or risk losing 7 VPs per loan cert. Yes it can still hurt you if you are unable to pay off your loans at the end of the game but it’s not as unforgiving as Agricola where if you do get one Begging Card, the -3 pts swing per card will almost assure you’ll lose the game. Buildings like the Baguette Shop and Joinery above are used to sell your resources. These buildings are important to the Builder-player who may not be able to grab the Shipping Line (the building that allows you to sell products through your ships; a key building for those using Shipping strategy). The Shipping strategy is strong as Ships are an important and consistent source of food. 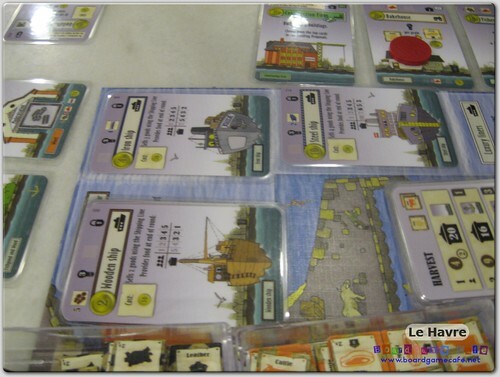 Each ship provides you with a certain number of food (every round) and is easily the best “food engine” in Le Havre. Once you’ve acquired a fleet of ships that can provide more than your food requirement, you can then focus your actions away from food-grabbing. 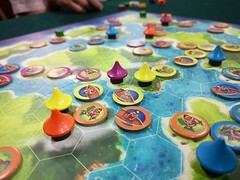 A player owning a fleet of three ships – two wooden and one iron ships – which beside providing him with a consistent 7 food each round, also allows him to sell 7 items whenever he uses the Shipping Line. Two key buildings in Le Havre – the Local Court and the Shipping Line. The Local Court allows a player to return loans for free (it still costs you an action) but as ayheng commented, your objective is to generate about $7 per action so if there’s nothing that gives you this return, going to the Local Court to settle your loans can be an useful option. The Shipping Line on the other hand is the most important building to those taking a Shipping strategy. I would say it’s even more important to those going for Building strategy as a good choke of the Shipping Line throw off the Shipper’s plans. 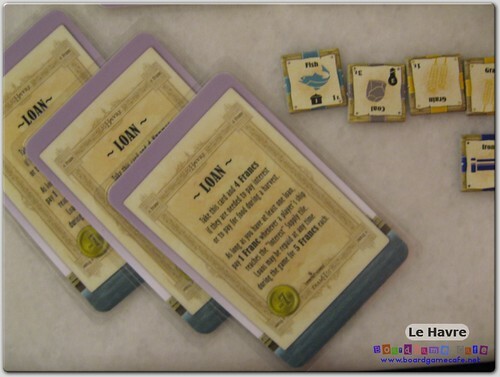 We’ve been playing 4- or 5-player Le Havre so far and with this number of players, the game is played over 20 rounds; each round comprising 7 turns. This does mean not every player gets to have 2 turn in each round.. but everyone will get the equal number of turn over 20 rounds (eg. 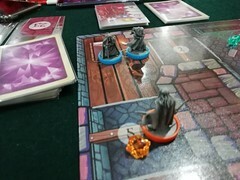 35 turns in a 4-player game). There are 30 standard buildings and 3 start buildings that will appear in all games. The only random feature is the appearance order of the 30 buildings – as they are first sorted into three piles randomly and then ordered according to their own sort number (lowest numbered buildings available first followed by the better higher-numbered buildings). While I initially thought the appearance order may not affect the game much, I’m beginning to change my thinking as I’ve seen games where if the wharf comes out late, expect food to be scarce and you better get an efficient food source (as an alternative to using ships to supply food to your worker). 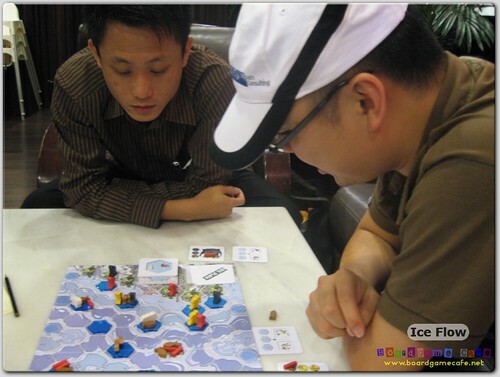 You can see in this game (above), whaft came out quite early and hence players tend to build ships to provide food to their workers. Wharf (there are two of them) is essential to building ships (especially wooden ones as their purchase price is too high to justify the outlay). The flow of the game will shift from collecting basic resources eg fish (food) and wood (building) to higher value resources like iron and coal which can either be processed to build the more valuable end-game buildings or sell for high prices. 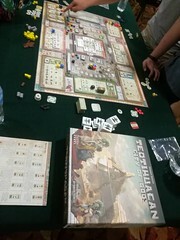 You can see resources like fish and wood pilling up (in picture above) as players shift their focus to the more valuable goods. This is not a bad thing. The question is; would you be able to craft a plan late game that can make good use of these resources given that they’ll be in abundance. At the end of the game, your score is counted by adding up the dollar value for every building you owned, plus the cash on hand (after paying off any loans you may have). The player with the highest net worth wins the game. 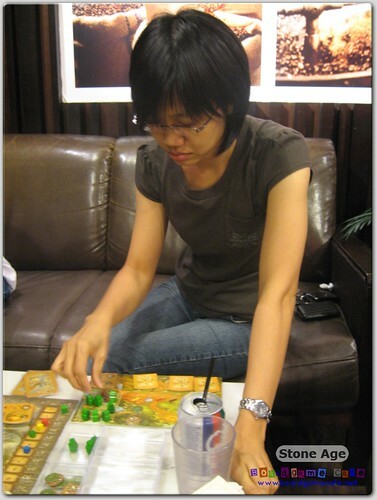 How do I find this game compared with Agricola? 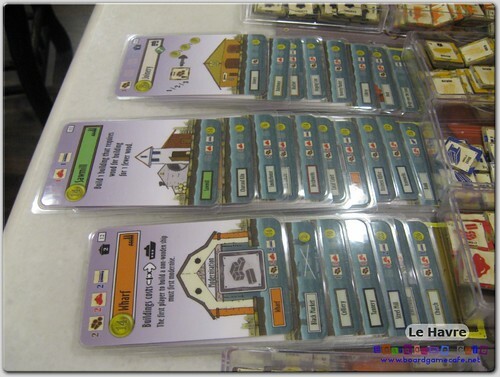 I’ll always enjoy Agricola but I would rate Le Havre higher than Agricola. In Agricola, each player would end up more or less with the same “farm”. Sometimes one or two farms may look different but usually it’s more of the same. In Agricola, each player chooses a different approach to get to the same “end-place”. 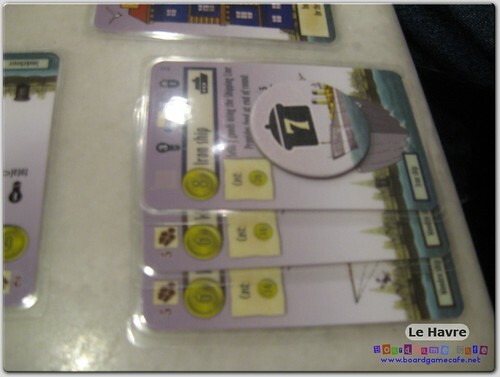 In Le Havre, there’s actually a true multi-path to victory ie. one player may concentrate on just building building building.. another may amass huge fleet of ships and make his fortune by selling selling selling. Yet another could attempt to outsell the shipper, not thru ships but thru the special buildings that allow sales of high value goods. On the other table, after finishing King of Siam cmun and shrapnel bid everyone good night. 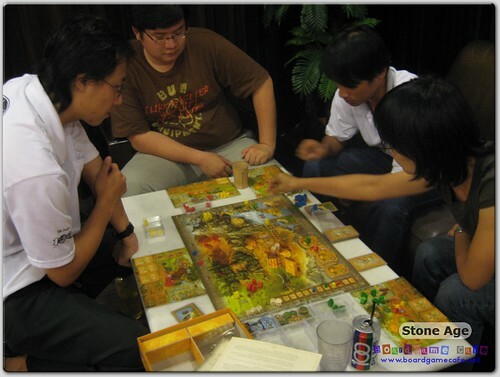 The rest – Phuah’s Klang Gamers and waiyan – continued with the game of Stone Age. 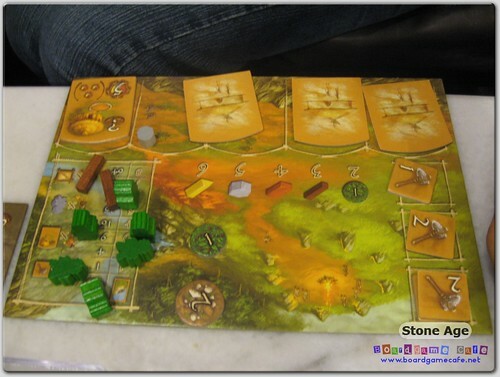 The player board (below) in Stone Age. 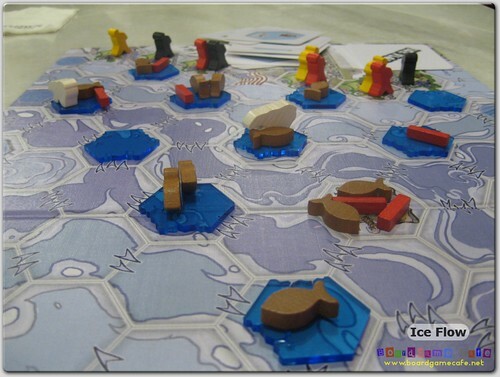 Afer completing our game of Le Havre, we decided to do one game of Ice Flow before calling it a day. 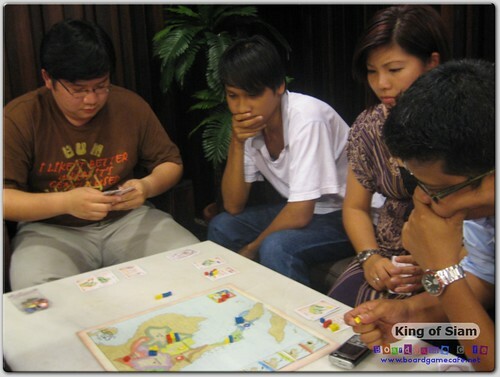 For more photos of this gaming session, visit our Flickr set. 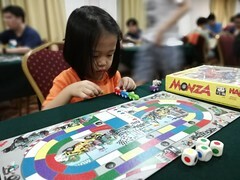 For more gaming reports, visit our Boardgame.net Blog. To discuss this gaming session, join us in Facebook. 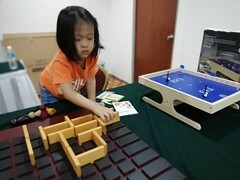 To buy the games played in this meetup, visit our Web Store. 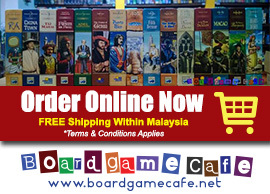 We carry over 300+ games and provide prompt delivery to anywhere in Malaysia.